For performing arts and educational seating clientele, the demand for a comfortable, yet aesthetically pleasing fixed seat can’t be ignored. With students and theatre lovers logging hours on end in these seats, functionality is a chief concern. With this in mind, we carry a select offering of fixed seating products specifically designed for auditorium and theatrical use, withstanding the wear and tear often associated with high-traffic seating locations, while also offering a beautiful chair to enhance your facility. This thoughtfully designed chair is designed using high-tensile-strength steel for the ultimate in strength and durability and as its name suggests, satisfies core principles grounded in sustainability and structural strength. 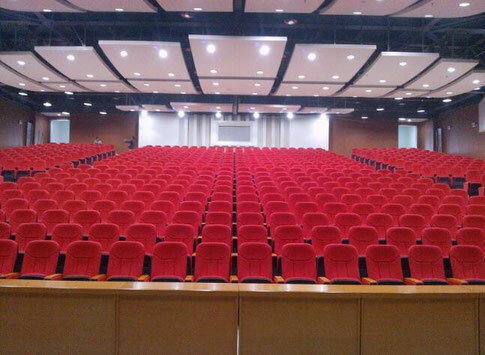 This line of auditorium seating offers a high value solution but is also equipped with a number of features and options that adhere to most venues’ unique needs and requests. The customization of this seat is seemingly endless, offering clients the choice of materials for use on end panels, arm caps and seat backings. Where contemporary styling meets true form and function, you will find our Stellar line of performing arts fixed seating. While typically reserved for theatrical facilities, these chairs are also a favourite of many arenas, specialty suites and places of worship, providing both facility operators and patrons a comfortable and aesthetically pleasingseating arrangement. The Stellar line boasts features such as a shift-resistant seat cushion and two independent hinge mechanisms to ensure the ¾ safety fold without adjustment for the full lifecycle of the chair. These chairs also have the unique ability to be mounted on level flooring, risers and beams and are accompanied by an integrally cast raceway to conceal aisle light wiring.